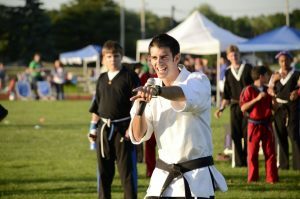 In 2013, at a small public school in Barrington RI, a few dedicated individuals approached Rocky Silva’s American Karate to perform and raise funds for The American Cancer Society’s annual Relay for Life vent at Barrington High School. When Mr. Lazouras, Founder of KfC, first embarked on the studio’s volunteer efforts, he thought maybe at best, the students could raise a few hundred dollars. By connecting the students passion for martial arts and breaking boards, with dedicating and commemorating loved ones, the break-a-thon took off with flying colors. Over three consecutive years, donations grew from a surprising first year success of about $13,000 to a third year growth of over $20,000. This cumulative success helped raise almost $50,000 in a 3 year period of time for the American Cancer Society. 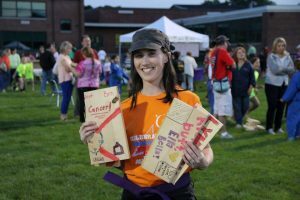 This is how Kicking for Causes was founded, through the trial and success of the combined student efforts and support of local community partners. Since then we have raised a total of over $130,000 for other organizations including the Alzheimer’s Association, Diabetes Research and support programs, and the American Heart and Stroke Association. At another local middle school, Kicking for Causes was contacted to support administrator’s efforts to educate 8th grade students on career based choices and learning opportunities in a clinic workshop day. Founder, Andrew Lazouras, met with Blue Ribbon principal, Dr.
Andrew Anderson, to discuss the current challenges facing young teens making their transition to high school next year. After hearing about challenges including peer pressure, bully intervention and substance abuse, they put together a team effort presentation which would help guide students in a motivational keynote presentation that was equally filled with humor as it was with heart-to-heart life lessons. Since then, Mr. Lazouras has returned 3 more times as keynote speaker to help inspire passion, determination and good decision making in the youth of the community, especially those who are vulnerable during this important transitional time in their development. Mr. Lazouras works with students of all ages through the keynote series, including adults and business professionals. One of the most human instincts that we possess is the desire to be safe and thrive. While most people will hopefully never have to defend themselves from an attacker, it is an all too real fact that some will be faced with this challenge either through domestic violence or other assault situations. It is our responsibility as trained professionals to give young people and adults alike, especially young females, the tools and awareness to avoid conflict and defend themselves if in an emergency situation. At a small private, all girls, catholic school; Kicking for Causes and its volunteer instructor staff have returned for 3 years to hold multi week training programs that focus on self-defense and assault prevention. 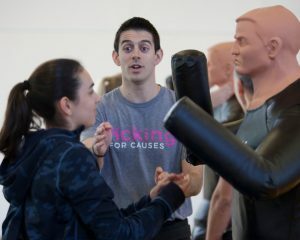 These sessions are extremely engaging and hands on, and cover a wide range of topics that include power of voice, awareness, vital striking and actual self-defense techniques and scenario training. At Kicking for Causes, we believe that knowledge and proper preparation are your best tools at becoming safe and confident. We wish all children and adults alike, had some level of formal training to help make the world just a little safer. Seminars are catered to the appropriate age demographic and the topics discussed are intended to help combat whatever the current challenges of that specific group are. Training through our programs is safe, fun and extremely empowering. Kicking for Causes is a non-profit public charity fundraising and advocacy campaign program designed to engage community members, families and children in leadership development, creative fundraising and martial arts training to further the growth and sustainability of local institutions including those dedicated to education, youth athletics, community development, medical research and more. Over the past 6 years, Kicking for Causes has helped raise nearly $130,000 for charitable causes. Below are some organizations who have teamed up with us to contribute fundraising resources and efforts to benefit various causes.